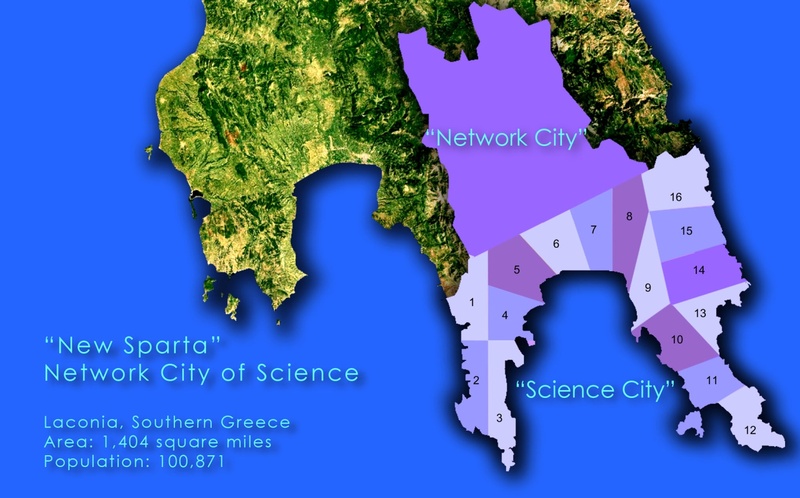 The “S-World Network – City of Science” concept originated from the preceding “American Butterfly” Eurozone economic thesis “Sparta Rises Again”, which focused on the creation of many resort networks adjacent to each other in Laconia Southern Greece, the original home of Sparta, to be named “New Sparta, City of Science”. 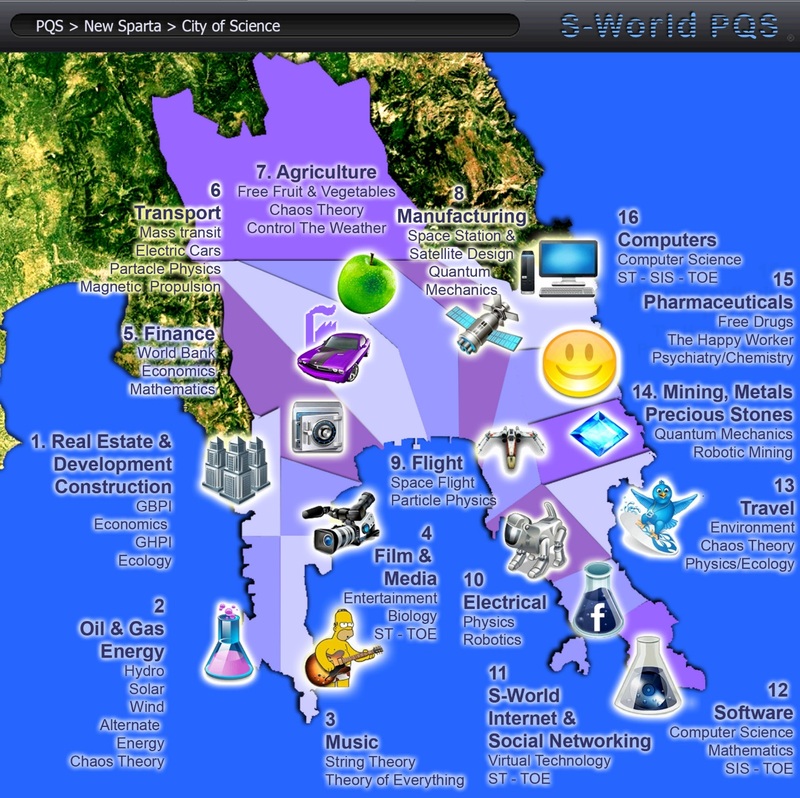 “New Sparta” is split into two parts: Network City & Science City with industry sitting in the middle. To adapt the model within the USA as the US has two of the 8 continental network cubes it would seem practice to situate one the “S-World Network – City of Science” in a southerly central location, maybe on the border with Mexico and another in a Northerly location maybe on the border of Canada. A Network City is designed as an international network-trading hub, seeing the land split evenly between qualifying nations, from where they build an embassy and a small resort network around it. The size of the city is not indicative of density, as existing settlements will remain untouched and in general expanses of nature will separate all countries allocated land. Science City in many respects designed to replicate “Silicone Valley” which started its life as a practical university. In the early 1950’s Stanford University dean of engineering, Frederick Terman, created a seven-hundred-acre industrial park on university land for private companies that could commercialize the ideas of his students. Science City is designed in a similar fashion, the City built around research and development in all fields applied to 16 industry sectors found within. Besides generating revenue independently Science City will be subsidized by all resort networks. The combined cities (Network & Science) become the host and central nerve station for Facebook Gifts, S-World & Buinessbook operations, vetting applications to join or work within the network, considering new ideas presented and acting as a customer service centre for retail & service inquiries or complaints. As each complaint or inquiry is central to the networks ambitions for product superiority, by 2018 the 100,000 or so staff dedicated to Facebook Gifts, S-World & Buinessbook operations all become an intrinsic part of the customer service network, each complaint seeing proactive assessment and when necessary definitive actions. With such a high compliment of staff on call the concept of phone auto attendants offending an endless series of digit options leading to voice mail recordings becomes a thing of the past. Alongside the availability of one on one conversations comes the reassurance that whoever one speaks to will do their best to assist in a courteous manor as the “Per human results, search engine” principal applies, the caller having the options to vote on the satisfaction of the conversation after it ends, simply by pressing either 1,2 or 3 on their telephone. The same principal will apply to web based enquiries. As we have seen in 2018 the economic stimulus method generates Facebook $24,369,441 based on guaranteed income, in addition to this income from paying customers needs to be estimated. To do this one needs to realistically estimate the number off customers expected to visit the store and how much each will spend. The general rule in estimating retail sales is “revenue per square foot”, at $6,200 per square foot Apple are the retail industry leaders by quite some way. This is not simply due to their branding; more significant is the concept that they do not sell a wide variety of products as such they do not need as much space. In second place comes Tiffanies at $3,000 per square foot, however on the whole most high end Mall’s relaters receiving the region of $1,000 to $1,500. Let’s examine the various reasons why Facebook Stores have the capacity to match Apple stores. Facebook stores are due to be based on the Apple concept of not having an overwhelming amount of products, an example: A large electronic goods store could be 25,000 sq feet, however as Facebook Stores only sell the top ten percentile of network products, the space need to sell electronic goods would take up only a tenth of the space. All in all there is a reasonable argument that Facebook Stores could match Apple Stores revenue, but for safety we shall work half it to $3,100, as such 25000 square feet multiplied by $3100 equates to $77,500,000 in the tills. From here we apply the 50% mark up and 10% sales tax and we are left with $23,175,000 in pre operations profits, however as the staff costs are accounted for via the economic stimulus revenue, we need only to concentrate on staffs profit share which would be in the region of $1 Million and a marginal $500,000 increase in operations budgets leaving $21,675,000. For the sake of contingency items an annual profit forecast of $20 Million is presented. Higher ________ OK ________ Lower ________? A few summary points will be presented before moving into the financial forecasting. Facebook E-Commerce and Stores products have a concise voting pool assessing all goods of which Facebook Gifts and Stores only present the top ten percentile. Facebook stores allow consumers to the touch and feel the products an experience not offered by competing e-commerce vendors. The University Media and Adverting departments create superior website imagery, including hi end photography, films or film clips and where appropriate 3D rendering renderings of products and services. Within “S-World Network – City of Science” Over 100,000 staff are available to assist consumers. The focus on high turnover on specific product ranges dictates higher wholesale ordering resulting in lower prices. Should only a like for like price be available, the knowledge that buying from Facebook Gifts assists the fight against global warming, protects ecology, provides medical aid, secures pensions and welfare for the disadvantage, in comparison to another company that sees profits used for personal gain, it would not be a stretch to boldly say, a consumer would need to be clinically insane to purchase from a un-philanthropic source. All polls taken regarding Facebook Gifts concept have indicate a 100% approval and usage rate. Having made countless financial forecasts over the years two major lessons have been learned. Firstly whatever your gut tells you it’s best to half it, as in general ones optimism tends to over inflate. Secondly half it again as it’s best under promise and over deliver. So the philosophy dictates safety should be found in a 25% forecast of initial estimates. This suggests that starting out with a 100% usage statistic one if four facebook members using the service is a safe bet, however to be truly minimalistic the forecast presented accounts for ratio of one in ten members using Facebook Gifts. On the left we see the category of user and the percentage of facebook members within it, after which we see the annually amount spent followed by the total revenue (cash in tills) received. Next comes the 50% mark up which equates to an item costing $1,500 being purchased for $1,000 from the manufacturer. It is worth emphasizing that the standard retail mark up is 100%, which would make a $1,000 item $2,000. The “Turnover after Tax” represents Facebook’s income after paying sales tax. “Costs” represent operational and staff costs. Note: As an on line service one would expect lower costs, however this figure includes the rather time consuming art of wrapping the gifts, writing the tags and the network service representatives salaries. The “Profit after Operations” sees the total profit divided between the 512 Resort Networks, this figure accounts for the second phase of 256 resorts due to launch in 2016. In regards to spending, caution has been applied the highest figure being $10,000, in polls one in ten suggested this would be the figure they would spend, if we note the 0.25% figure next to the “Cherished Users” column this indicated that only one in 400 would spend this much, all in all a very guarded estimate. Please note the “New Users” column at the bottom, this account for the Baby Boomer generation joining facebook. America Butterfly Question, AB11: Is this figure a reasonable assessment? Facebook Gifts Plus is the everyday version of facebook gifts, in essence facebook stores on the web, people spend a more on everyday items than gifts hence the greater profit return. America Butterfly Question, AB12: Is this figure a reasonable assessment? As described earlier “Lx” is exclusive to the top 1 percentile of the world’s net wealth holders and earners, before looking at the forecasts, two aspects need to be explained. Firstly and simply Facebook “Lx” will be called ” Lx” so remove the connotations of elitism from the Facebook brand proper, Lx on its own has nice connotation of Love Kiss” Lx.” Facebook have the further option of exchanging the “Lx.” application for the S-World.Biz Business Gifts application, as described shortly. Secondly the “Lx.” retail system is what is later described as a “GDP Buster” as whist it makes profit for facebook, due to the low Mark Up’s for high spenders it is designed to stimulate economic growth by encouraging the super rich to spend money as opposed to saving and investing. With over 40% of the worlds wealth owned by the top 1% and the other 45% owned by the top 10% encouraging the movement of this capital will result in a significant rise in global GDP, GDP being “the amount of money spent by businesses and citizens with a year”. For top spenders we are looking at an average mark up of 2.5% depending on the type of goods or services purchased. Property for instance would see a 0.5% mark up, on the other end of the scale a top of the range mountain bike would see a 10% mark up. In general due to shop rent, staff, taxes and general operations a bike shop would sell such a bike at a 100% mark up, if it cost $2,000 to manufacture, it would sell for $4,000. However if bought via “Lx.” The same bike would cost $2,200. With goods as such value, the super rich will be more inclined to buy them, relatives receive more flamboyant Christmas presents, wives receive more jewellery, and billionaires buy more supercars and yachts. Besides the lower “Mark Up”, there are four differences to the facebook gifts model, most significant is the amount spent, whist the top tear of $25 Million seems like a lot this category only accounts for one in 560 of those qualified to become “Lx.” members. The second difference is in “Operating Costs”, if we consider selling one luxury item can cost ten to one hundred times more than a standard goods item, the need for staff is lower, as such presented costs decrease from 60% to 30%. However for “Service clients” spending over $1,000,000 a year the mark up increases due to dedicated concierge staff. Thirdly the amount of resorts increases from 512 to 768, as unlike facebook gifts “Lx.” profits are split between all resorts. Lastly a $10,000,000 deduction is made for Lx lounges, much the same as exclusive lounge bars in New York or LA, however “Lx” lounges will be subsidized to the tune of $10,000,000 thus affording the Michelin Star chef’s, stylish, attentive staff and named performers, whilst selling food and beverages at reasonable prices. America Butterfly Question, AB13: Is this figure a reasonable assessment? In the same vein as Facebook Gifts Plus becomes the general e-commerce facebook product delivery system, “Lx.” Infinity is the every day usage version of “Lx.” Gifts. Looking at the top tear “Diamond Plus” we see a $50,000,000 spend, this is representative of one of 0.006% of facebook members, adopting a dedicated network concierge team to look after their purchasing and procurement needs. At a mark up of 2.5% in comparison to the standard 100% if one was to spend this amount in a year, it would make sense to do so via there “Lx.” Concierge procurement team, not only will the recipient take advantage of the low mark-up, a dedicated team within the network would have excellent knowledge of the best products and services found within the network. This figure accounts not just for everyday items and general travel and concierge items, alongside these capital acquisitions such as off plan real estate in future resort networks and other high price items. Please notice the Diamond Plus on the far right at $2,563,477 a figure far lower that lower spending members, this is indicative of the ”GDP Buster” concept where in essence for “Lx.” is close to a loss leader, the object of the excursive being to generate as much revenue as is possible for the suppliers. As this business model/concept is unique and as such it is impossible to accurately predict usage, as such the figures have been worked on 2500 “Lx.” Infinity Diamond Plus members, considering the advantages the service could well see more. America Butterfly Question, AB14: Is this figure a reasonable assessment?